Q1. How many bundles of hair do I need for a full head? A: It depends on how you maintain it. Treat it like your own hair and take very good care of it, and then normally it could last longer than 1 year. A: It may happen if the hair is too dry. Please make sure to wash & condition your hair at least once a week, twice a week is better. Q4: Can they be straightened, curled? A: Yes you could use hair straightener or hair curler to style. 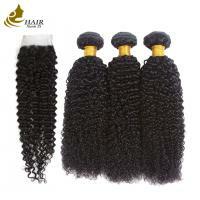 However, don't do it too frequently, or the heat will make the hair easily get dry and tangled. A. Yes. The hair is made of 100% 100% virgin Brazilian/Malaysian/Indian/Vietnamese/Burmese/Chinese human hair, so they can be colored. As a general rule it is easier to darken the hair than to lighten the hair. We recommend dyeing darker, since it is difficult for the original color to fade. Improper dying will ruin the hair. We highly recommend you to ask for help from your hairdresser. Q6: Why the colors of hair extensions don't seems exactly as the pictures show or description says? A: There might be color difference between different monitors. You could dye the hair if you need different color. 1. We will do our best to serve our customers ! 2. We will refund you for items returned within 7 days after you receiving them for any reason. A full refund will be given if items are returned in their original condition. 3. Merchandise which is damaged or missing components is not refundable.Buyers are responsible for return shipping with proper packaging. On receiving items, we will refund you immediately. 4. Please tell us first when you return the goods and please return it by EMS.then we can solve it quickly.